Practicing gentle yoga sequences is a great way for beginners to learn the poses. Gentle yoga also serves as a simpler and safer alternative to more vigorous varieties. This first sequence is a great option if you are short on time. In addition to warming up your body, it will open your shoulders, stretch your hips, and strengthen the muscles of your abdominals, chest, and back. Begin in child's pose. Start on your hands and knees, then press your hips back toward your heels. Lower your belly, chest, and forehead to the mat, and extend your arms out in front of you. Breathe here for a few moments. Rock forward onto hands and knees, then tip your hips forward into low plank. Lower down through a modified crocodile pose, also known as chaturanga. Hug your elbows toward your ribcage and bend them, lowering your chest and torso toward the floor. Make sure to keep your shoulders away from your ears and shoulder blades hugging together on your back. Release all the way to the floor. Walk your hands back so they are beside your ribcage, draw your shoulder blades together on your back, then inhale up to cobra. Release down to the floor again. Press your hips back to child's pose. Repeat as many times as you want. Your full practice can take as little as five minutes and as much as ten. Feel free to linger in child's pose to help center your mind before you leave your mat. The next sequence is like what you would see in a typical gentle yoga class. The poses used in this sequence help open your shoulders and the muscles around your hips. Each move is matched with the flow of your breath. Begin in mountain pose, standing at the top of your mat. As you inhale, sweep your arms out to the side and up above your head. Connect your hands at the top. Exhale your hands into prayer position at the center of your heart. Repeat steps two and three five to eight times. On an exhale, fold forward into a standing forward bend. Hold for a few breaths. 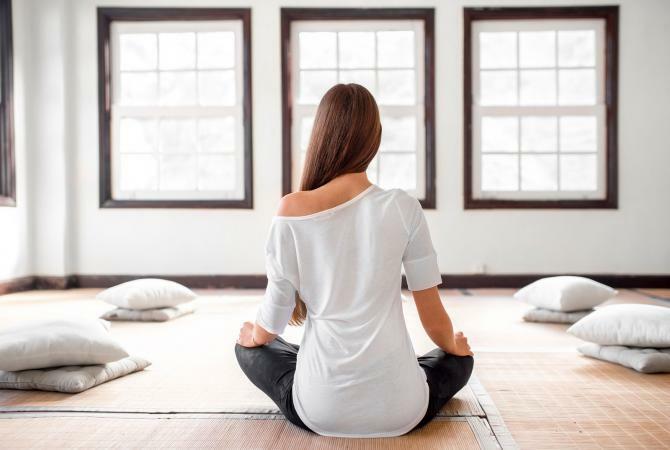 As you inhale, either keep your fingertips on the floor or place them on your shins and lift your torso halfway up, drawing your shoulder blades together on your back, lifting your heart, and gazing forward in a standing forward bend. Exhale to fold forward again. Repeat steps six and seven two more times. Inhale to rise all the way up, sweeping your arms out to the sides, and coming up to standing. Palms connect at the top. Exhale your hands to your heart. On an inhale, release your right hand to your hip and extend your left arm up alongside your ear stretching it up to the ceiling. As you exhale, bend to the right, reaching your hand overhead toward the top corner of the ceiling. Hold for a few breaths. On an inhale reach your arm straight up, rising tall. Exhale to release your arm down. Repeat steps 11 through 14 on your right side. On an inhale, interlace your fingers behind your lower back and draw your shoulder blades together. On your exhale, straighten your arms and lift your chest. Hold for a few breaths. Gently tilt your head to one side. Make sure to keep your shoulders relaxed. Take a few breaths here. Inhale sweep your arms up. Place your hands on the floor and lower yourself down to hands and knees. Repeat cow and cat for eight to ten rounds of breath. On an exhale, lower down to your belly. Come to your forearms with your elbows underneath your shoulders. On your inhale, isometrically pull the floor toward you, lifting your chest, and engaging your shoulder blades. This is sphinx pose. Hold for a few breaths. On an exhale, send your hips back to child's pose. In child's pose, walk your hands to the right side of your mat and hold for a few breaths. Repeat step 30 on your left. Return your hands to the center of your mat. When you're ready, make your way onto your back. On an inhale, hug your knees into your chest. As you exhale, come into a spinal twist. Extend your arms out to the side, palms facing the ceiling, and rotate your knees to one side. Hold for a few breaths. When you're ready, move into savasana, or corpse pose, by laying flat on your back, arms by your sides, legs extended out in front of you. Gentle yoga is a simple way to begin yoga. It will help you increase your flexibility and strengthen your muscles. Reap the benefits by pulling out your mat and trying one of these simple sequences today.